We recently received a cryptic phone message from one of our sponsors, Classic Industries, inviting us to bring a camera to a nondescript address in Orange County, California. No other information was provided. Naturally, we accepted. When we arrived, we were met by a large warehouse with a man outside waiting for us just outside the gate. He shepherded us through, promptly closing and locking the gate behind us. No turning back, one supposes. As we exited the vehicle, we surveyed the derelict cars neatly arranged around us. The man introduced himself as Jason Poling, caretaker of the “collection” we were about to view. The term “collection” stood in sharp contrast to the dusty, sun-bleached boneyard before us. These cars, we were told, were for reference and fitment tests, although they would occasionally single one out for restoration. The real show was inside. 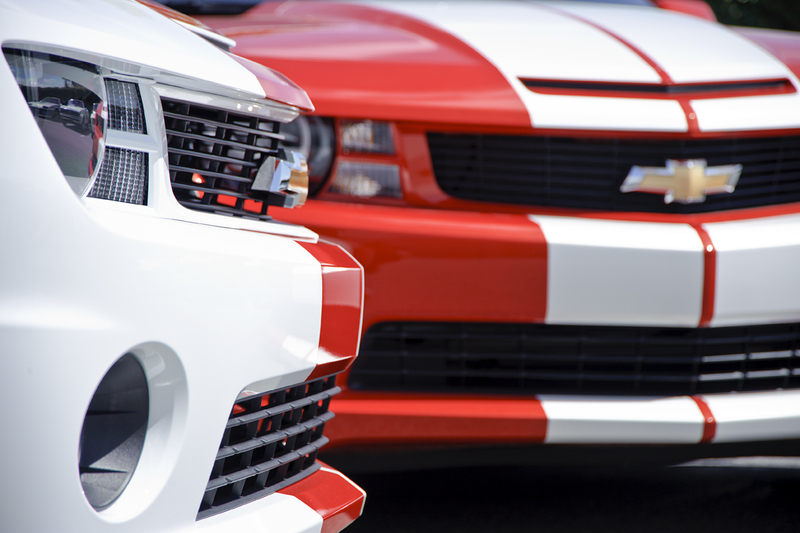 As Jason rolled up the warehouse door, we were presented with a group of extremely unique automobiles more worthy of the term “collection” – every production version of Camaro pace car that Chevrolet produced. Second only to its sister the Corvette, the Camaro has provided pacing duties at the Indianapolis 500 a staggering seven times. The only generation of Camaro absent is the second generation (1970 through 1981) – though second gen Pace Cars were used for other races during this period. 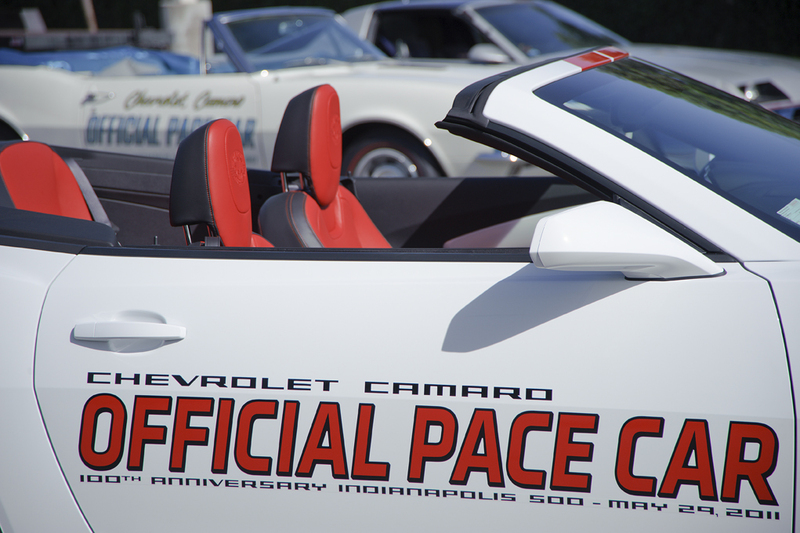 Pace Cars are integral to the running of the Indianapolis 500; these vehicles guide the racing cars to a rolling start and, since 1978, also protect vehicles, track crew, and emergency services during during periods of caution. 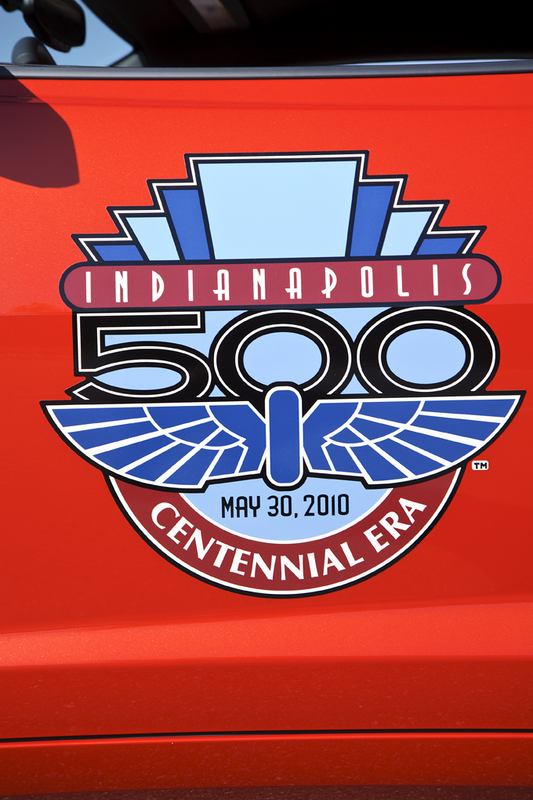 Although Chevrolet did not provide factory support for teams running in the Indy 500, its marketing department realized that the audience was the perfect demographic for a sporty, powerful coupe or convertible, and in early 1967 Chevrolet announced that their new model – the Camaro – was chosen as the pace car for that year’s Indianapolis 500. The 1967 pace car example before us was one of just 100 or so created for use during the race festivities, including chauffeuring track officials, drivers, celebrities or other dignitaries around the event. 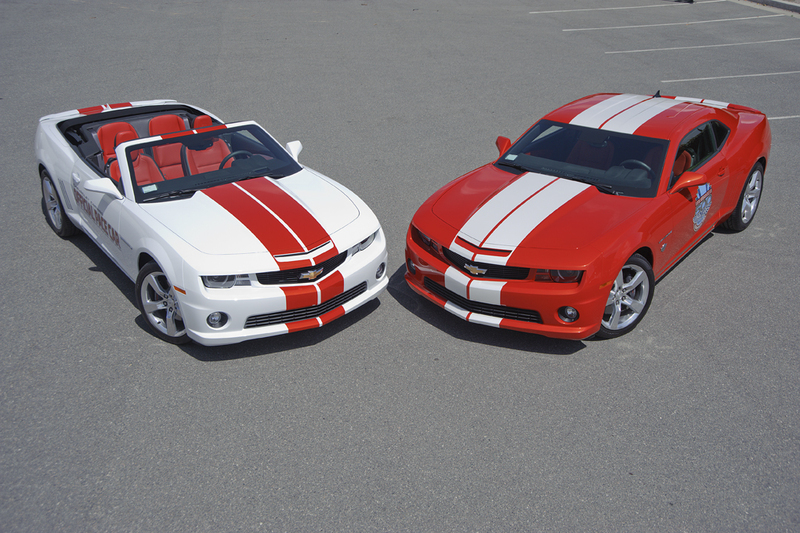 For the event, Chevrolet equipped their Camaros as top-of-the-line models, packaged as SS/RS 396 model convertibles. Painted in Ermine White with blue interior and two colossal yellow flags on poles affixed to the rear bumper, the Camaros couldn’t be missed. Nor could it be missed when Mario Andretti drove the pace car through an enormous poster of a checkered flag. All of their marketing worked though, and the 100 pace car “replicas” – plus 44 more that were not at the event – were snatched up by the public after the race and helped to boost overall 1967 Camaro sales. In 1969, Chevrolet was once again graced with providing a Camaro pace car for the Indianapolis 500. Chevrolet again chose a stunning color combination, Dover White with Hugger Orange stripes and interior. And as if you could ignore the technicolor appointments, you would be entranced aurally by the RS/SS’s 396 singing its sweet song. Chevrolet produced the customary 100 replicas as well as awarding one to Mario Andretti, that year’s race winner. In addition, however, Chevrolet offered the pace car replica option to street cars that year. Under 3700 convertibles were offered as pace car replica convertibles in 1969, and significantly fewer were offered as pace car coupes. No production numbers exist for the coupes, but suffice it to say they’re very rare. The second offering of pace car replicas to the public proved very lucrative to Chevrolet – total sales of Camaro street cars topped 243,000 in 1969. The convertible pace car here has an bygone, perhaps unrealized past; it may have been a vehicle used for dignitaries during the race festivities, but most information remains hidden. It was restored in 1988 for Classic Industries. Ending a long pace car “drought” for the Camaro, the 1982 Z28 brought back the pace energetically. 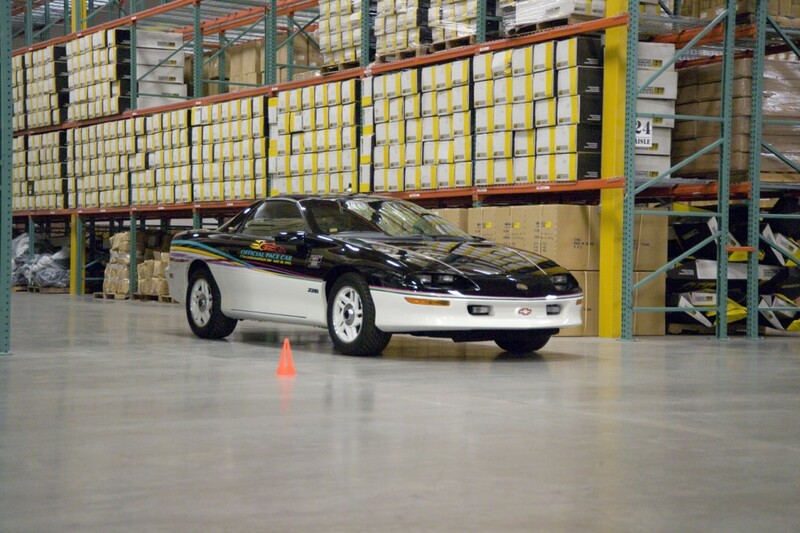 In a bleak period of American performance vehicles, the Z28 pace car replica – of which 6,360 were sold – injected some much needed enthusiasm to overall Camaro sales. 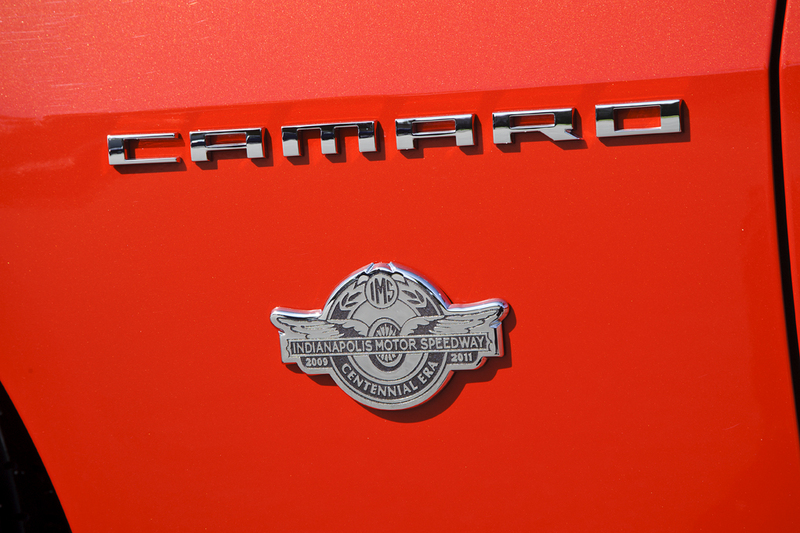 Offering a standard 2-barrel 305 V8 or a fuel-injected 305 in the Z28 pace car replica and boosted by improved handling characteristics, the third generation Camaro itself was on its way to being crowned America’s best-handling sports car. The 1982 Z28 pace car here helped mold this opinion of the brand new Camaro and helped restore some of the interest and energy into what had, by the end of the second generation, become a neo-gothic cathedral with four wheels. 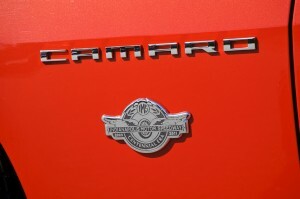 For the unveiling of its fourth generation, Camaro was selected a fourth time to be the pace car for the Indy 500. 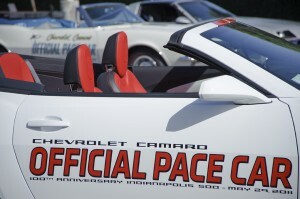 Chevrolet again offered a pace car replica package, RPO B5A. With wild graphics and a two-tone paint job, the Camaro couldn’t be missed. It evidently couldn’t be sold either; an embarrassingly-low number of 633 were purchased with the pace car package. This example is one of those extremely limited production – bought by Classic Industries new in 1993 from the local Chevrolet dealer – and has just over 100 miles to its name. It is a beautiful example and very rare to boot. Unfortunately, the fourth gen pace car’s sales figures also foreshadowed the decline of the Camaro’s popularity; it ceased production in 2002 without a defined successor to its name. Chevrolet dusted off the Camaro name in 2005 for Chevrolet’s new Zeta rear-drive platform. Chevrolet began work on a concept and it was unveiled at the North American International Auto Show in 2006. Due to overwhelming demand GM decided to build the Camaro. A coupe and convertible were confirmed. 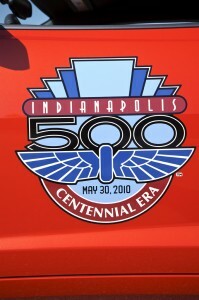 In 2009, a pre-production Camaro once again was tapped to pace the Indianapolis 500, and has done so now three times in a row; the most recent, an Olympic White convertible with Hugger Orange stripes, is the first convertible Camaro to pace the Indy 500 since the 1960s. All things equal, the Camaro has enjoyed a pretty nice run as the Indianapolis 500 pace car. With seven appearances through four generations under its belt, it stands a testament of American character and determination to withstand 45 years of economic, environmental, and philosophical ebb and flow. These Camaro pace cars, as well as every other Camaro on the road today, embody the true American spirit. Hopefully, when Chevrolet unveils their all-new Camaro in 2014, they will again be back at the Brickyard, bringing the field down the back straight and to the waving green flag. We thank Classic Industries for giving us an exclusive look at their Camaro pace cars. You can convert your Camaro into a pace car with their line of pace car stripes, decals and emblems.